An article, originally published in Anti Gravity, and short film that traces the parallels between two devastating hurricanes spread a century apart. The southwestern rim of Lake Pontchartrain, commonly referred to as the German Coast, is a composite of landscapes both real and imagined, their details spread across plat maps, sunken concrete, and digital artifacts. The landscape of today is a broken swamp, like many others in South Louisiana. The cypress of Maurepas has been heavily lumbered, leaving strange radial patterns etched into the earth where the trees were felled. The once robust bottomlands of Labranche were similarly gouged in order to construct the Interstate 10 highrise that passes from Kenner to LaPlace. These channels have introduced saltwater, and a familiar process of erosion has played out across the region. One of these developers, the Walker Land Company, sold many parcels in an unimproved stretch of cypress swamp they designated the “LaBranche Industrial Park.” Soon after, the company was under investigation by the U.S. Secretary of Housing and Urban Development (HUD) for withholding certain particulars of the development before selling the properties, such as omitting major details in the property report to HUD, including plans for the construction of a marina, boat-town, golf course, tennis courts, motel, and regional shopping center—all promised in advertising. They were also cited for failing to address who would be responsible for draining lots below sea level, as well as neglecting to detail how access to these lots would be achieved, since there weren’t any streets or roads. In the 1970s, as residential demand in St. Charles Parish increased, private real estate developers envisioned an opulent lakeside suburb that would bury this denuded wetland, complete with tennis courts, shopping malls, and broad tree-lined boulevards. 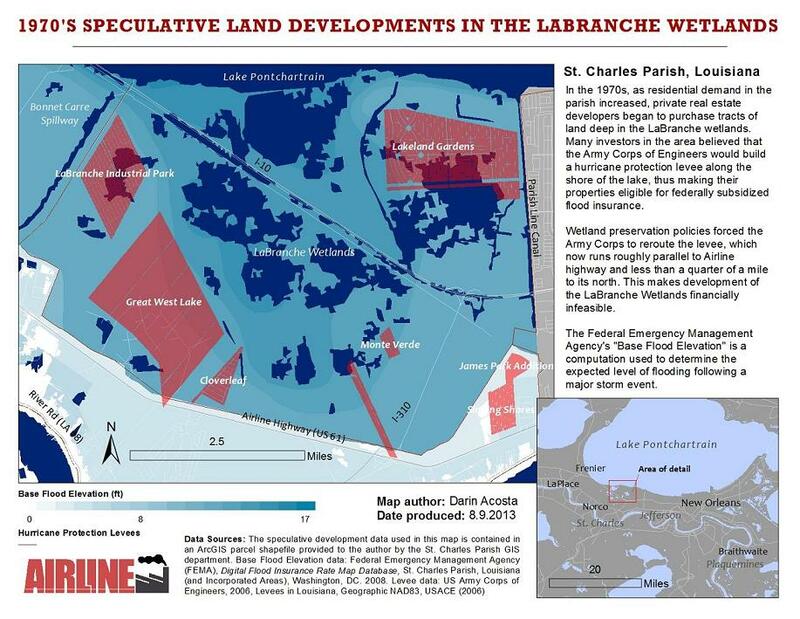 They began purchasing tracts of land deep in LaBranche, with a belief that the Army Corps of Engineers would build a hurricane protection levee along the shore of Lake Pontchartrain, thus making their properties eligible for federally subsidized flood insurance. Ultimately, wetland preservation policies forced the Army Corps to reroute the levee, which now runs roughly parallel to Airline Highway, less than a quarter of a mile north of the road. This has made development of the wetlands financially infeasible. Individuals who bought property from the Walker Land Company and other developers now own parcels that are submerged beneath as much as 15 feet of water. This entry was posted in Film, Written on November 30, 2016 by darin. Over and over, you climb the shipping container beside the school and jump off. You imagine your shins bursting into little pebbles and dust. Over and over, you shoot ball bearings into the squirrel’s head, but the squirrel won’t die at every rise of southern California, bouncing through the countryside between the urban array. Over and over, the same song plays. Laughing hard from your gut as the couple argues and the girl cries knowing the laughter is awful; is a mistake. Over and over, you have a dream that the sky of Louisiana is a mirror and you see in the sky the earth concave, the features transformed, the lights of the oil platforms all beholden small and distant as the reflection disintegrates day by day. What’s behind the mirror is another mirror, a bathroom mirror, a yellow mirror, your face. You hold up fingers before your eyes. You remember your awful jokes. Conversations in crowds. Lines outside doors. Chord grass and snakes. Naked in rivers, hidden behind dumpsters. The dried bones of the interstate. The hands that will listen and the hands that will work. The hands that will listen as the same song plays. This entry was posted in Written on November 22, 2016 by darin. Originally published in the American Guide. New Orleans Times Picayune. May 6th 1988. Shell Oil erected their catalytic cracking unit in the early 1950s during a multimillion dollar expansion boom. The unit itself was 16 stories high, a “colossus of the petroleum industry” as described by the New Orleans Times-Picayune. The new machinery grew outwards and upwards from the old tiers of the refinery, consuming 3,178 tons of structural steel, 27,500 cubic yards of concrete, 8,000 valves of all shapes and sizes, and thousands of pilings driven deep into the deltaic mud. By 1955, the enormous expansion was complete. The small river town of Norco, Louisiana now had an industrial skyline, and the cat cracker was its most impressive spire. As decades passed, however, the unit became just more steel in the bizarre landscape of the town. It was a single component in a system of petrochemical production that was growing ever more complex. More variables, more hazards. A new chemical agent was introduced to the daily production process of the machine, but the corrosive properties of the agent weren’t adequately tested. Over the course of six months, it began to wear away a pipe elbow deep inside the machine. The corrosion formed a hole, and through the hole, hydrocarbons poured into a confined chamber of the unit. It created a dense, combustible ball of gas; and on the predawn morning of May 5th, 1988, within the chamber something sparked. This entry was posted in Art & Media, Written on May 5, 2016 by darin. You and your sister break into Wal-Mart in the aftermath of a devastating hurricane with a stranger you met on Craigslist. Interactive fiction with sounds by Seamstress & Amitai Heller. This entry was posted in Art & Media, Written on February 18, 2016 by darin. I’ve been thinking through the summer of 2005 a lot lately. Not just because of Katrina 10 hype — though that’s a huge part of it — but also because of the quality of this summer’s heat; the varying kinds of emotional energy that have been flowing through both my life and the lives of people I love; my frequent visits to Sisters in Christ, which has an ambiance that is, to me, reminiscent of pre-Katrina New Orleans (must be all the early 2000s emo); and, most significantly, because I recently dredged up some old emails from the weeks surrounding the storm, which help me to reconstruct small pieces of my Katrina experience. This entry was posted in Written on July 22, 2015 by darin. Wake up to the sound of a pile driver thumping, the clack and hammer and building, mixed-income and private condominium and storefront and on-ramp and sunrise. It’s 6:40 AM. Watch the videos caught with a drone as it flies over an expanding sink hole. Listen to interviews, ingest media of all kinds, with an open heart of flare stacks and fiber-optic fencing along rail lines and through the structural decay and accretion of decades and eons of the physics that we wear as skin. Feel the flaring hometown and halogen basement downtown, both of them concrete and metal, both ticking like turn signals and gliding like tail lights whether walking or driving or biking or even standing still. Photons, Facebook, oil and gas. Node compile_incidents, git push and there it is on a map, all the points upon pixels that give contour to this shapeless capitalism that envelopes your world in its own distinct atmosphere. “Flaring as seen from the Luling Bridge at 8:10pm on January 3rd. Very bright, looked like a forty foot flame at least!” Eat, shower, watch Netflix, find peace. This entry was posted in Written on March 20, 2015 by darin.